LUNCH STUDIO: Johny's, with O. If you are looking at this photo of sausage links and over easy eggs thinking, I have to have some, you would not be the only ones. Eyeing dishes enviously from the counter stools, we drooled over every one being made in front of our eyes. 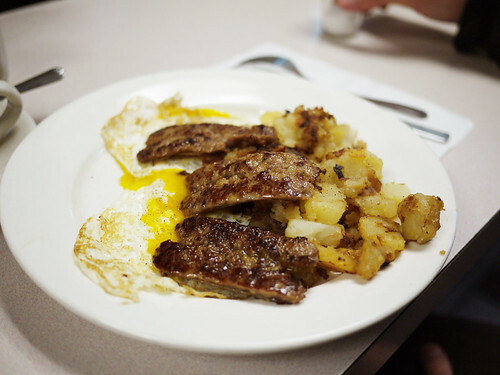 O. wisely ordered breakfast at Johny's Luncheonette, and was not disappointed by this classic greasy spoon joint. We split the "Famous Sloppy Johny" and a side of MacDonald style crispy fries. It's not the same as the old school European charm of the Stage, but every bit as welcoming. We already plan on going back for the french toast, at least three orders went out during our sejour there.